However old or young your children are, the task of looking after them will always weigh heavy on you. The total cost of raising a child is increasing every year, and the most recent figure is $233,610! This is to raise your child up to the age of 17. After they hit 17, there are, arguably, even bigger costs afoot, and your child may have to lean on you a bit more to pay for a rental bond, or buy a car, or go to college. Education is a right for every single one of us, and depending on where you are in the world it can be incredibly difficult to save up the money to set them on the right path. What's the solution? It begins and ends, with you. Having children is a financial hardship, whichever way you look at it, and from the moment you bring your baby home from the hospital, you will have to start thinking up ways to be financially savvy. Your lifestyle will be a big factor in how you save money. If you earn a decent wage but never manage to save money, look at what you can realistically cut back on. It’s easier said than done, but surely your children are more important than you, right? A savings account is the simplest way to get the ball rolling. It’s the little and often approach to saving money. If you open up a savings account when they are a year old, they’ve got 17 years of savings to dip into when they're making the transition to college. Or if they don’t want to go to college, it’s money towards a car, mortgage, or a wedding. Just set up a small amount to come out of your account every month, and you will amass a fair amount of money ready for their next stage in life. Keep the account a closely-guarded secret, and it becomes a pleasant surprise for your child! If you're at that point where it’s too late, and you cannot travel back in time 17 years, there's no need to panic. Luckily, if your child is that keen on going to university, they will work hard for it, and so it makes applying for scholarships a financially easier option. There are plenty of scholarship websites, and these are the most recommended ones to try. Lots of scholarship websites have detailed lists, and give you breakdowns of what is required. Some of the websites require you to register or pay a small amount, but these do give comprehensive details of what you will need to obtain the scholarship. 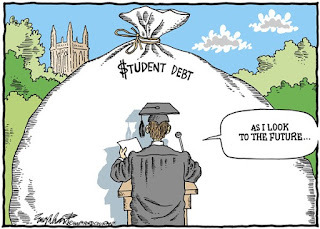 Of course, there are student loans available, but with each different loan comes a different set of criteria. As a parent, you can obtain a PLUS loan which comes with a higher interest and means that you are responsible for paying the money back, not your child, so the burden is on you. But if you are in a position to repay the money sooner, you can save money on your total interest. There are many things you can apply for, and you may as well try them all, but with each loan comes with a high-interest rate of repayment. So it’s worth bearing that in mind before you enter into the agreement, but it’s possible that you or your child could get turned down for the funds, in which case, it’s always a good idea to have a backup plan. Apart from saving in the long-term, the real way for you and your child to pay for their education is to get an extra job. While it may not sound ideal to get a second job on top of your full-time one, it’s not the same as it was 20 years ago, where you would need to get a janitor or bartender job. Now you can do another job from your own home. There are online surveys and actual full-time hours for admin jobs you can do. If you are stuck for cash as well as stuck for time, you can do this and get everyone in the family to contribute. It can potentially be more lucrative for your child to do this rather than to get a Saturday job because they won't need to travel to the place and get more money for arguably less work. Saving up for your child’s future is a massive headache, and while the best solution is just to plan ahead, there are other options should you get stuck between a rock and a (financially) hard place.